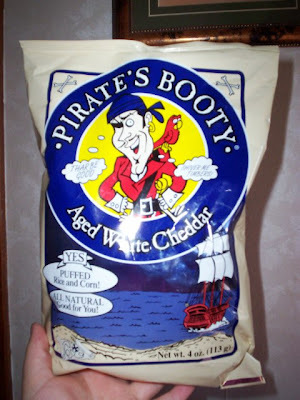 I think the first time I ran across Pirate's Booty was in a health food shop. We took a chance, bought a bag, and have been buying them ever since. These little rice and corn puffs of white cheddar are a delight. They're all natural, no sugar, low in fat and calories, and taste fantastic! THE VERDICT: They are light, crunchy, cheesy, make a perfect snack that's not bad for you. If you haven't tried them yet, what are you waiting for? This week they are on sale at Stop & Shop for only $2.50 a bag.